I did a simple mockup of what could be an improved Welcome Screen. Some distros have excellent Welcome Screens like Ubuntu Mate and Budgie. In these Welcome Screens there is an introduction to the project, shows its features and help in the first configurations. This greatly helps newcomers to the Linux world. 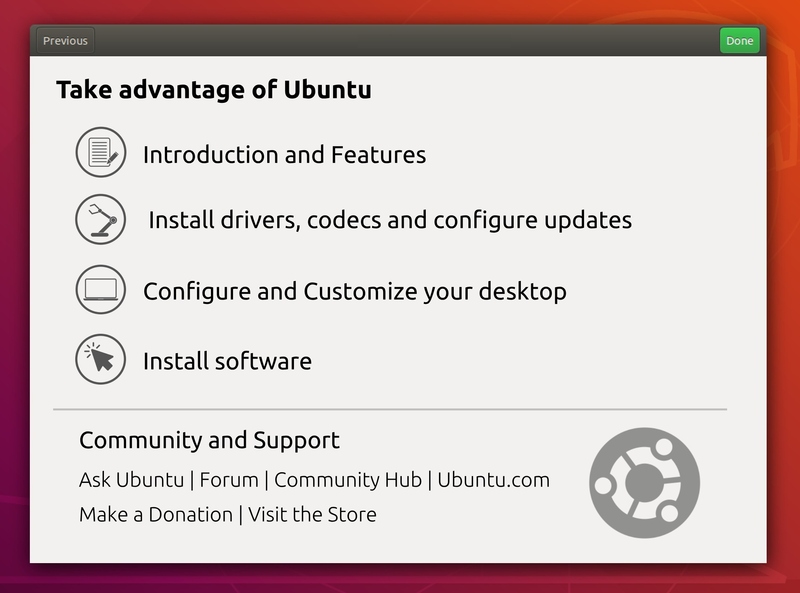 I think the Welcome Screen of Ubuntu is good and reminds me a bit of the initial settings of macOS. But I think a few more options could improve it even more and be more useful to users. This is just an example. Aesthetics should be improved and other options could exist. These options would appear after the first settings present in the current Welcome Screen. And after the screen is closed for the first time, when reopening went directly to these options. In this button would open a new screen. In the new screen showed an introduction to the Ubuntu project and the system features. This option would indicate how to install drivers, third-party codecs and restricted extras (as this option is not checked by default in the installation it is easy to ignore it). There should be a general explanation of the package Software & Updater. These settings are important to most users because they help them have a functional computer. 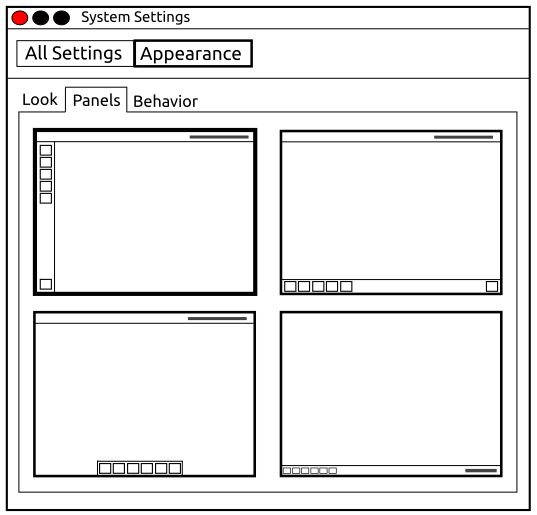 This option would lead to a new screen that would have a button for Settings app and indicated some possibilities of desktop customization. It would be interesting to mention the existence of the Gnome Tweak tool, what you can do with it and present some extensions that might be useful, such as Dash to Panel. Many users, especially those coming from Windows, would probably feel more comfortable activating this extension. In the Welcome Screen of Ubuntu Mate there is an option to change the layout of the Desktop. I find this very useful for new users, they usually prefer to change the layout to something that is more familiar. I think that presenting such options on Ubuntu would hold more users and prevent them from going to other distros. It would show suggested apps and link to Ubuntu Software. This screen appeared previously, so this option would only appear when opening the Welcome Screen again (and if the option to go back was disabled); or, the previous screen would be removed and only this new option would exist. In this part would be presented some links. Ubuntu distro was a highly recommended for those who came to the linux world, but now other distros have been more recommended for beginners. I often hear that other distros are now more user friendly than Ubuntu. Whenever a new version of Ubuntu comes out it is also common to posts about the first things to do after installing the system. Some of these posts are still useful (which is not good), with an improved Welcome Screen these posts are no longer useful. I think that improving the Welcome Screen is one of the things that can be done to satisfy new users. It serves as a guide, facilitates understanding of the system and helps in the initial settings.